Great blue herons are the most widespread variety of heron in North America, and one of them has taken to frequenting the field around Mitchell cabin. Great blue herons typically weigh 4.5 to 8 pounds and measure 36 to 55 inches from their heads to their tails. Their wing spans are huge, 5.5 to 6.5 feet. As birds go, their stride is also impressive, usually around nine inches in a straight line. 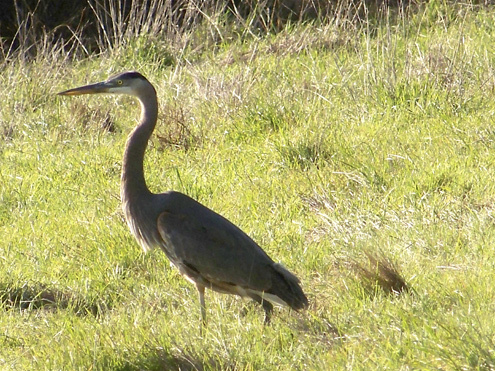 A Great blue heron and a Blacktail doe take a late-afternoon stroll together in my pasture. 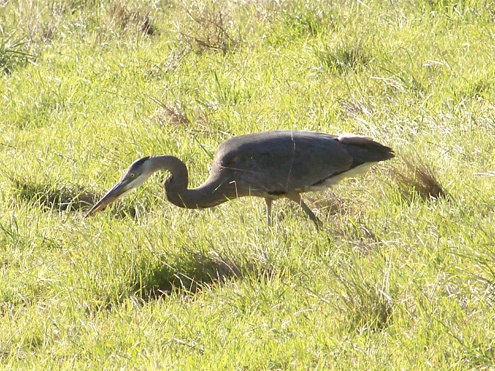 Although herons do much of their hunting in shallow water, where they prey on small fish, crabs, shrimp, and insects, they also hunt in fields such as mine, where they dine on rodents, frogs, snakes, and even small birds. Great blues swallow their prey whole and have been known to choke on oversized morsels. 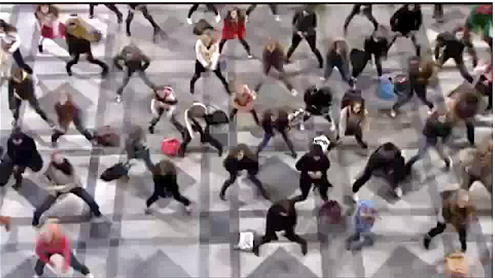 In other matters, if you have not yet seen the YouTube video of a “flash mob” in the Antwerp, Belgium, train station, you really ought to. As people walk through the bustling station, a recording of Julie Andrews singing Do Re Me from The Sound of Music starts playing. Dancers young and old gradually emerge from the crowd until roughly 200 of them are prancing in the center of the lobby, much to the delight of onlookers. Most of us know the song: “Do, a deer, a female deer; re, a drop of golden sun; mi, a name I call myself; fa, a long, long way to run…” The tune was running through my head yesterday, so I began singing it for my friend Lynn Axelrod. I’d add that it’s just as easy to spot something else that probably contributed to Lynn’s misunderstanding. In the musical, Julie Andrews as a governess teaches the song to the von Trapp family children to mitigate the Austrian-military-style parenting of Capt. von Trapp. Western Africa. 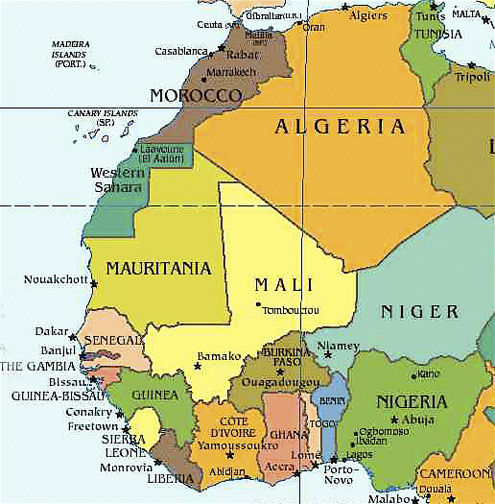 Ghana is in the center at the bottom of the map. I used to wonder who the viewers are of all the beauty and wisdom this blog imparts each week, so I checked. Although numbers vary from day to day, the largest group of readers consistently comes from the United States, particularly California. They’re followed (at the moment, which is fairly typical) by: Canada, the United Kingdom, Germany, India, Australia, and Mexico. Somewhat to my surprise, however, were the many regular visits this blog has been receiving from the geographically small country of Ghana on the west coast of Africa. Of the roughly 200 countries on earth, Ghana was recently 9th in visits, is currently 15th, and has consistently been in the top 25. These are not the robotic visits of computers making contacts with this blog for only an instant. Typical visits last from 45 seconds to nine minutes, and often they come from people who have never visited this site before. By African standards, Ghana with a population of 18 million is not unusually impoverished thanks to gold, oil, diamond, bauxite, and agricultural exports. Its literacy rate has been steadily improving, and if its residents keep getting information from this blog, it could become among the most-sophisticated countries in sub-Sahara Africa. 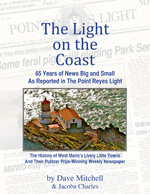 More than you wanted to know …. For the longest time I thought the Neil Diamond Song “Forever in Blue Jeans” was the Reverend Blue Jeans, like a pastor named Blue Jeans. Those are cool pictures of the bird and the deer. I look up a lot of song lyrics to find out what they are saying. For the first time I just found out what “Louie Louie” was about! I enjoyed sharing improv videos with you on youtube!! I shared the ones you showed me with friends from work!! Loved them too! Sparsely Sage and Timely is powered by	WordPress 4.9.10 and delivered to you in 0.622 seconds using 56 queries.